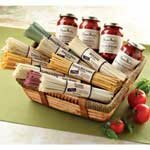 Rossi Pasta Deluxe Pasta and Sauce Basket. Can't make up your mind what to choose? This basket does it all. Includes one 12 oz. package each of Spinach Basil Garlic Fettuccini, Tomato Basil Garlic Fettuccini, Lemon Pepper Fettuccini, Capelli d'Angelo (Angel Hair), Vino Rosso Linguini, Roasted Red Bell Pepper Fettuccini, Artichoke Linguini, Classic Fettuccini and Italian Spice Linguini, and 15.5 oz. each of our Classic Marinara Sauce, Artichoke Sauce, Sun-dried Tomato sauce, and Vodka Sauce. Can't make up your mind what to choose? This basket does it all, at a great price. Features nine pastas and one of each of our four new gourmet sauces. Includes only all-natural pastas and sauces. No artificial colors, flavors, or preservatives. Comes gift packaged with a personalized gift card at no additional charge.